UPDATE 11-19-12 - GAZA AND ISRAEL EXCHANGING MANY ROCKETS - 1,000 FROM ISRAEL TO GAZA - 1300 FROM GAZA TO ISRAEL. ISRAEL HAS AN ANTI-ROCKET PROGRAM THAT CAN KNOCK DOWN MISSILES THAT ARE HEADED FOR POPULATED AREAS. THEY DON'T BOTHER WITH THE ONES THAT ARE HEADED FOR EMPTY GROUND. HAPPENS. MEDIA IS ALL THERE WITH TV CAMERAS ROLLING. 11-21-12 - DREAM - I was in a house somewhere with the radio on. At the time, I was researching the topic of tin manufacturing. They announced on the news that Israel had been hit by 30,000 bombs. Immediately I had to get in a bathtub of warm soapy water to decontaminate myself and then the house. Next to the bathtub was another bathtub, and all I had to move the water from one bathtub to the other one was a small sponge. From the bathroom door, I could see an old grandmother sitting at the kitchen table, and my boyfriend - a middle aged man. 11-25-12 - AFTER TWO BLESSED DAYS OF CEASE FIRE: HEZBOLLAH WARNS ISRAEL THAT TELEVIV IS THEIR NEXT TARGET. JERUSALEM -- Palestinian militants fired a rocket aimed at Jerusalem on Friday, setting off air raid sirens throughout the city and opening a new front in three days of fierce fighting between Israel and armed groups in the Gaza Strip. The Israeli campaign has been limited to airstrikes so far. But military officials say they are considering expanding it to a ground campaign. The Israeli military seemed to be edging closer to a ground invasion of Gaza on Friday, saying forces were "on standby" and "ready to enter should it be decided that a ground operation is necessary," according to the New York Times. Lt. Col. Avital Leibovich, a military spokeswoman, said the military had called 16,000 reservists to duty on Friday as it geared up for a possible ground offensive. She said the army had authority to draft an additional 14,000 soldiers. She would not say where the troops were deployed. As air-raid sirens went off in Jerusalem, witnesses said they saw a stream of smoke in Mevasseret Zion, a Jerusalem suburb. Israeli police spokesman Micky Rosenfeld said the rocket landed in an open area near Gush Ezion, a collection of Jewish settlements in the West Bank southeast of the city. An attack on Israel's self-declared capital marks a major escalation by Gaza militants, both for its symbolism and its distance from the Palestinian territory. Located roughly 75 kilometers (50 miles) away from the Gaza border, Jerusalem had been thought to be beyond the range of Gaza rocket squads. Abu Obeida, spokesman for the Hamas militant wing, said the group had fired a long-range rocket at Jerusalem. "We are sending a short and simple message: There is no security for any Zionist on any single inch of Palestine and we plan more surprises," he said. Hamas officials said the rocket was a homemade "M-75" rocket, a weapon that has never been fired before. It also marks a bit of a gamble for the militants. Gush Ezion is close to the Palestinian city of Bethlehem and just a few kilometers (miles) from the revered Al-Aqsa Mosque in Jerusalem's Old City, one of Islam's holiest sites. Jews call the compound the Temple Mount because of the biblical Jewish temples that once stood there. Hundreds of thousands of Palestinians live in Jerusalem and nearby areas of the West Bank. Militants already have fired rockets into the southern outskirts of Tel Aviv, another unprecedented achievement, on Thursday. The rocket attacks have not hurt anyone in the bustling metropolis, but have caused panic and jitters. Just a few years ago, Palestinian rockets were limited to crude, homemade devices manufactured in Gaza. But in recent years, Hamas and other armed groups have smuggled in sophisticated, longer-range rockets from Iran and Libya, which has been flush with weapons since Moammar Gadhafi was ousted last year. Most of the rockets do not have guided systems, limiting their accuracy, though Israeli officials believe the militants may have a small number of guided missiles that have not yet been deployed. The strike occurred on the third day of an Israeli offensive in Gaza meant to halt rocket fire from the crowded seaside strip. 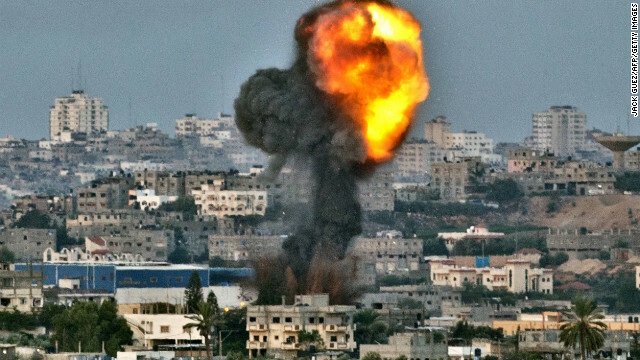 Israel began the offensive Wednesday by assassinating Hamas' military chief and striking dozens of rocket launchers. But militants have continued to rain rockets across Israel. The military spokeswoman said no decision has been made on whether to send ground troops or how long the Israeli offensive will last. Leibovich said all options are open, "including a ground operation." Along the border Friday, tanks, armored vehicles and military bulldozers were parked in neat rows. Soldiers milled about, while buses filled with soldiers moved in the area. Hamas militants have vowed to resist the Israeli offensive. They received a boost of solidarity on Friday with a visit by Egypt's prime minister, Hesham Kandil, who called on Israel to end its operation. In all, 23 Palestinians have been killed, including 11 civilians, according to Gaza health officials, and 250 people wounded. 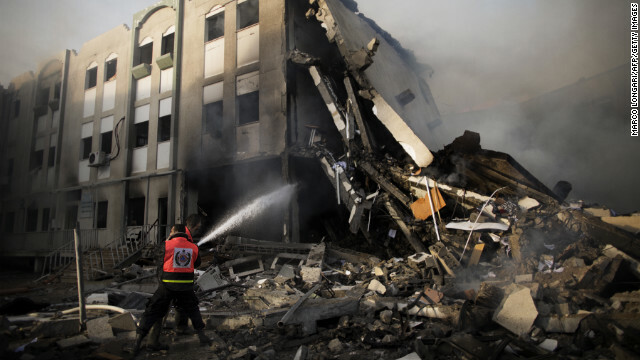 Three Israelis were killed when a rocket hit an apartment building in southern Israel. 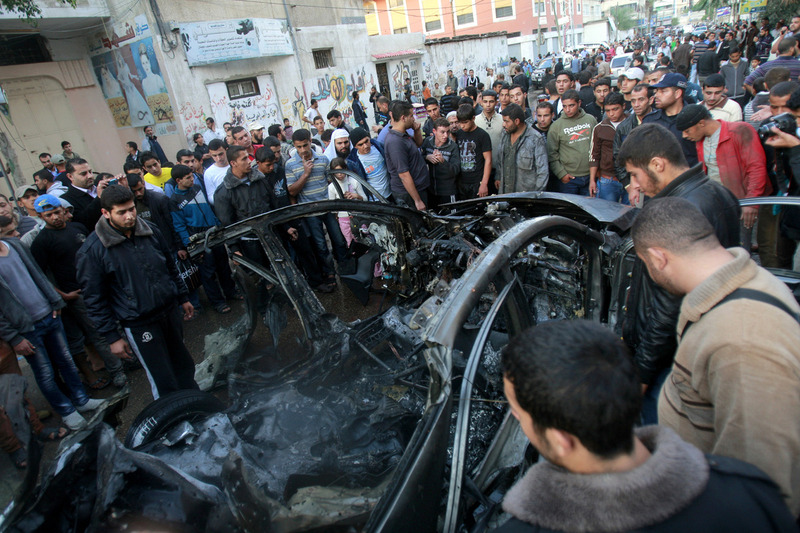 ACCORDING TO NEWS REPORTS THIS WAS THE PLANNED ASSASSINATION OF THE HAMAS LEADER. Palestinians extinguish a fire after Israeli air strikes targeted an electricity generator that fed the house of Hamas's Prime Minister Ismail Haniyeh in Gaza City. It is with horror that I watch the latest events in Gaza unfold. As a Canadian based in the West Bank who once lived in Gaza, I know the fear that is currently running through the veins of each man, woman and especially child as they face Israel’s unrelenting aerial and naval bombardment. 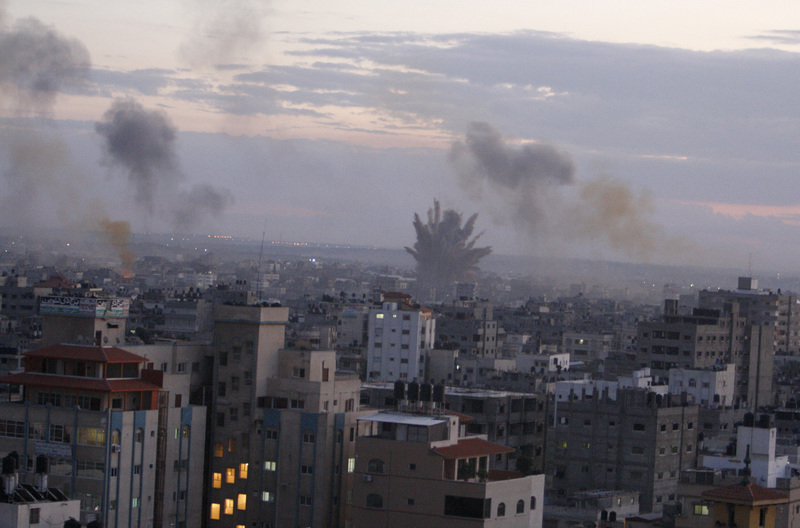 My time in Gaza was marked by long periods of aerial bombings and sonic booms. I still– 6 years later – live with those horrible memories and the sheer sense of helplessness and hopelessness that ensued. Today, the Gaza Strip is a much different place. The people have not changed – they are just as vibrant, funny and full of life as they were when I lived there – but their living conditions, and prospects for a bright future, have grown dim. Today, the people of Gaza suffer from a brutal blockade that has lasted for more than 6 years and isolation that has lasted for more than 20 years. Israel strictly controls imports into Gaza and exports are virtually non-existent. Palestinian life is so controlled by Israel that the Israeli government even sets policies on the minimum number of calories needed to prevent malnutrition. Access to the sea – one of their main sources of livelihood – is strictly curtailed and the water of the Gaza Strip is barely drinkable, with less than 5 per cent of their water supply fit for human consumption. Today, Gaza is an open-air prison and it comes as little surprise that UN agencies recently concluded that, in a few years, Gaza will become unlivable. But these facts have to be put in their proper light by looking at the population of Gaza. Today, 90 per cent of Gaza’s population is descended from the over 750,000 Palestinians ethnically cleansed in 1947-1949 from their homes in what is today Israel. More than 50 per cent of the population of Gaza is under the age of 18 and 20 per cent are under the age of 5. They live in one of the most densely populated places on Earth, without reasonable prospects for survival. All of these measures – the blockade, isolation, siege, and damaged water supply – will have a tremendously detrimental impact on the lives of these young individuals. These are not natural disasters, but man-made ones. Now, heaped on top, is Israel’s latest bombing campaign, one that does not distinguish civilian from combatant, adult from child – notwithstanding false Israeli claims otherwise. The effects are sadly on display: In the past few days alone, Israel has dropped more than 250 bombs on this densely populated land. These attacks are supplemented by naval and tank shelling. Among the 22 Palestinian victims are two school children playing soccer, an 11-month-old infant, a pregnant mother and three other children. Israel has repeatedly asserted that any “democratic country” such as Canada would do the same and that it was left with “no choice.” These are patently false assertions. What Israel fails to explain is that other democracies have not maintained a brutal 45-year military occupation over another people; that other countries have not denied freedom to another people for decades; that other countries do not routinely expropriate land for Jewish-only housing and roads and that democratic countries do not control virtually every aspect of the lives of another people (including caloric consumption). Yes, there are other options: Israel can easily end its military rule over Palestinians – in both the West Bank and the Gaza Strip – and allow Palestinians to live in the freedom and dignity that is their right, and that of others around the world. Continuing to maintain control over the lives of others is only a recipe for disaster. History has demonstrated that no subjugated people will willingly live under oppressive rule. The Palestinians are no different. The time has come for Israel to end its oppressive rule and allow the Palestinians to live in freedom. Bombing a civilian, stateless, refugee population is not the answer. Diana Buttu is a Canadian lawyer based in the West Bank. In 2000-2006 she served as an adviser and negotiator for the Palestinian Liberation Organization and to Palestinian president Mahmoud Abbas. Israeli soldiers ride on top of an armored personnel carrier close to the Israel-Gaza border,in southern Israel. …The White House on Thursday threw its full support behind Israel's military response to a barrage of rockets fired by the Islamist Palestinian movement Hamas that rules the Gaza Strip. Deputy National Security Adviser for Strategic Communications Ben Rhodes said it would be "up to the Israeli government" whether to follow up punishing airstrikes with a ground assault. 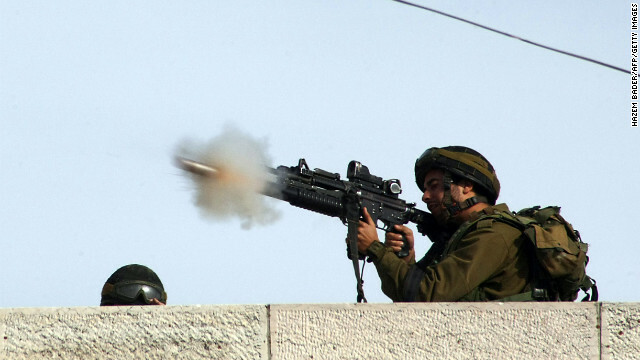 "Our view is that the Israelis have the right of self-defense when their citizens are faced with the threat ofindiscriminate rocket fire from within Gaza," Rhodes told reporters on a conference call. Asked whether the Obama administration would have any issues with an Israeli ground assault, Rhodes replied that "ultimately, it's up to the Israeli government to make determinations about how they're going to carry out their military objectives." The Associated Press has reportedthat Hamas fired more than 200 rockets on Thursday, killing three people, and that Israel seemed to be gearing up for a groundinvasion of Gaza. The escalating conflict amounted to President Barack Obama's first major foreign policy test since winning re-election Nov. 6.Rhodes said American officials werein close consultation with their Israeli counterparts "to have an understanding of their plans going forward." The Obama administration has beenin discussions with Turkey, Egypt and "some of our European partners," he said, thought to have sway over Hamasin order to get them to urge the militant organization to halt its rocket attacks. "At the United Nations, where this is being discussed, we've sought to keep the focus where it should be—which is on Hamas's rocket fire as the precipitating cause here," Rhodes explained. "What we've also said is that the best course of action would be for there to be a general de-escalation of the violence, but that the onus is on Hamas—and those withinfluence over Hamas—to help bring about that de-escalation, so that we don't see a widening conflict," he told reporters. "So we certainly want to see a de-escalation, we certainly want to see a broader conflict avoided." The official noted that the White House has urged Israelto take "all steps ... to avoid civilian casualties." He added, "And we deeply regret the loss of life on the Israeli and Palestinian side." Israeli Ambassador to the United States Michael Oren briefed key senators on the operation. The lawmakers—Democrats and Republicans—released a joint statementexpressing "solidarity" with Israel while warning that "escalation will only lead to further suffering on both sides." Israelis take cover in a pipe used as a bomb shelter, after a rocket was launched from the Gaza Strip on Thursday, November 15 in Kiryat Malachi, Israel. Rockets and shells crisscrossed between Israel and Gaza on Thursday as Palestinian militants continued rocket attacks on Israeli civilians and Israel pounded what it called terror sites. CNN) -- Israel launched a series of blistering airstrikes Wednesday on what it says are terrorist targets in Gaza, killing the chief of Hamas' military wing and at least eight others, Israeli and Palestinian officials said. As the tensions ratcheted up, the U.N. Security Council held an emergency meeting Wednesday evening. Palestinian leaders immediately condemned the attacks as an escalation, with President Mahmoud Abbas calling for an emergency session of the Council of the League of Arab States to discuss what he called Israeli "aggression," the Egyptian state news agency MENA reported. 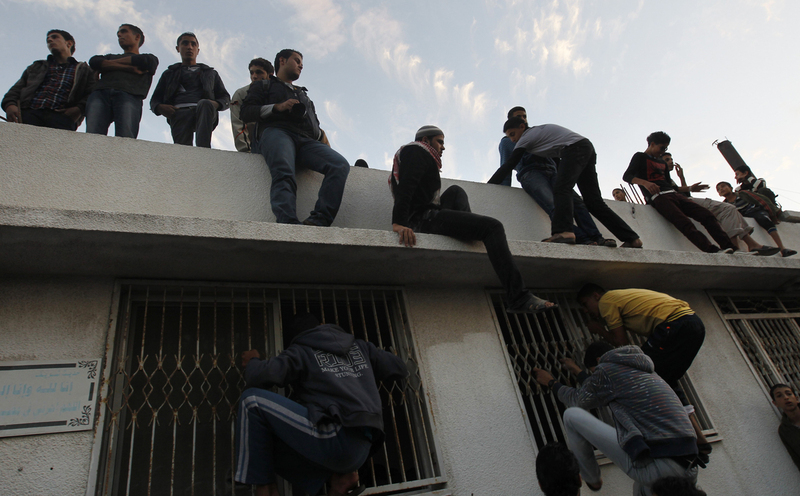 Hamas' military wing warned that Israelis had opened "the gates of hell on themselves" with the move. A report on the Israel Defense Forces website said Brig. Gen. Yoav Moredechai would not rule out a ground attack. "Infantry brigades have been shifted in preparation for the operation," he said, according to the website. Israeli military spokeswoman Lt. Colonel Avital Leibovich said: "There are some reserve units that are preparing but nothing more than that at this point." 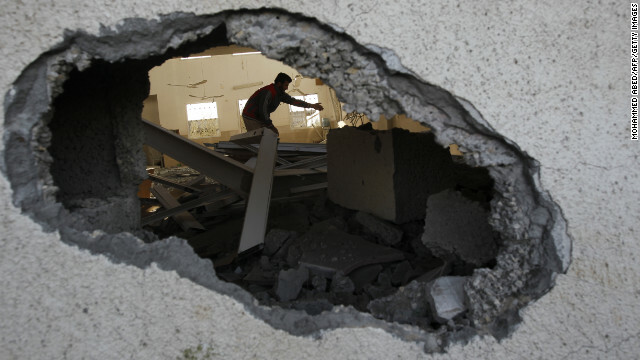 There were at least 70 strikes by warplanes and ships Wednesday, officials from Palestinian militant groups said. As night fell, more airstrikes could be heard, and Hamas security officials said four more attacks hit empty swaths of farmland in Gaza late Wednesday. The IDF said at least 128 rockets had been fired from Gaza since Saturday. Israel's Iron Dome air defense system intercepted 28 rockets launched at Israel on Wednesday, the IDF said on its Twitter feed, which it was updating almost hourly with new details as well as links to photos. One of the posters on the IDF's feed was Al-Qassam, the military wing of Hamas, which has the Twitter ID of Alqassam Brigades..
PPalestinian medical sources said at least eight people died in the Israeli airstrikes, including two young girls, and 84 others were wounded, 10 in serious condition. However, the health minister in Gaza, Mufid al-Mukhalalati, put the death toll at seven. TThe Israeli operation -- which the military calls "Operation Pillar of Defense" -- came after Prime Minister Benjamin Netanyahu warned this week of pending retaliation by Israel for increased rocket attacks from Gaza. "I would ask you, I'd ask any person around the planet: What would you do if your population was targeted day after day?" Israeli government spokesman Mark Regev said, later adding that "you have to see our operation as fundamentally defensive." Egypt recalled its ambassador to Israel on Wednesday, the Israeli Foreign Ministry said. A senior Israeli official said its ambassador to Egypt returned home, but that move wasn't related to the ongoing violence. The official wouldn't comment on whether Israel had pulled its entire diplomatic staff from Egypt. The United States said Israel has the right to defend itself, according to a statement from the State Department. "We strongly condemn the barrage of rocket fire from Gaza into southern Israel, and we regret the death and injury of innocent Israeli and Palestinian civilians caused by the ensuing violence," the statement said. "There is no justification for the violence that Hamas and other terrorist organizations are employing against the people of Israel. We call on those responsible to stop these cowardly acts immediately." The White House said in a news release that President Obama spoke with Netanyahu by phone, reiterating the United States support for Israel. Obama also spoke with Egyptian President Mohamed Morsy and the two agreed it was important to help de-escalate the situation quickly, the White House statement said. A spokesman for Hamas, Osama Hamdan, claimed that Hamas has been defending itself from Israeli attacks. "I think the ones who declared war was Israel, and I think the Palestinians are in the position of defending themselves and nothing more than this," he said. Hamas will resist as long as the Israeli offensive lasts, Hamdan said. Israeli navy ships could be seen firing into Gaza from the Mediterranean. The navy struck "terror sites" there, the IDF said via Twitter. The Israeli military said in a statement Wednesday it targeted "a significant number of long-range rockets sites" to deliver "a significant blow" to Hamas' underground rocket-launching capabilities and munitions warehouses. Some of the munitions warehouses were in civilian residential buildings, which showed that Hamas uses a strategy of human shields, Israeli military sources said. "The aim of targeting these sites is to hamper their rocket-launching weapons build up capabilities," the IDF statement said, adding that the Gaza strip had become "a frontal base for Iran firing rockets and carrying out terrorist attacks against Israeli citizens." Read more: Can rival Palestinian factions reach unity deal? Angry crowds gathered at the heavily damaged vehicle that contained the bodies of al-Ja'abari and his bodyguard. Saeb Erakat, the chief Palestinian negotiator, condemned "in the strongest possible terms" what he called the Israeli assassination of al-Ja'abari. In an interview with CNN, Erakat labeled the attack the beginning of a "major, major Israeli escalation," and he called on the international community to pressure Israel to halt its operation. Al-Mukhalalati, the Gaza health minister, also called on "the free world to stop this massacre committed by Israel." Asked about assassinating al-Ja'abari, Regev said the Hamas military leader headed a "terror military machine." "This is the man with blood on his hands. This man is a known and wanted terrorist," he said. "In taking him out, Israel was acting legitimately." The latest escalation in violence is part of a cycle of attacks between periods of relative stability between Israel and the Palestinians. "This was both inevitable and predictable," said Aaron David Miller, a Middle East expert and vice president at the Woodrow Wilson Center. There is no long-term basis for both sides to find a lasting peace, he said. Israel and the Palestinians have "completely different political and strategic goals," Miller explained. The focus should be on how to bring security until a basis for long-term stability arises, he added. CNN's Ashley Fantz, Elise Labott and Tom Cohen contributed to this report. The BBC's James Kelly: "As dawn broke there was no sign of any let-up in the violence"
Israel's aerial bombardment of Gaza has intensified after it authorised the call-up of 30,000 army reservists, amid reports of a possible ground offensive. 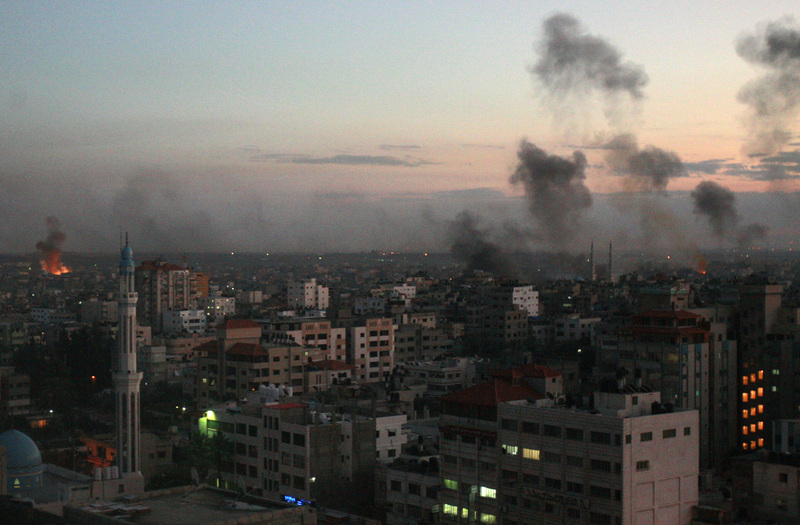 Israel said it fired at more than 130 targets in Gaza overnight, saying militants fired 11 rockets from Gaza. On Thursday rockets were fired 70km (45 miles) north of Gaza towards Tel Aviv. Fighting has intensified since Israel killed Ahmed Jabari, the military leader of the Islamist group that controls the territory, on Wednesday. At least 18 Palestinians in Gaza have been killed in Israeli airstrikes, including children, and three Israelis have been killed by Palestinian rocket fire into southern Israel. Egyptian PM Hisham Qandil is to travel to Gaza later in a show of support. Israeli Prime Minister Benjamin Netanyahu has said his country's offensive action would be suspended during the three-hour visit, as long as no rockets were fired from Gaza. Explosions continued in Gaza throughout Thursday night as Israel stepped up its air bombardment, with huge blasts rocking Gaza City as dawn broke on Friday. Palestinian militants have continued to fire rockets at Israeli cities: by Thursday night, Hamas said it had fired more than 350 rockets from Gaza, of which Israel said 130 had been intercepted by its Iron Dome missile defence system. In Tel Aviv on Thursday, residents took cover after air raid sirens alerted them to a missile threat for the first time since Iraq targeted the city with Scud missiles during the Gulf War in 1991. One missile landed in an uninhabited area while another is thought to have landed in the sea. The armed wing of Islamic Jihad said it had fired an Iranian-built, Fajr-5 rocket - which has an estimated range of 75km. The focus of the Israeli night-time television news was the possible widening of this conflict to affect the country's biggest city and main commercial centre, Tel Aviv, where alarms sounded earlier. There were no reported injuries but two rockets, apparently with a longer-than-usual range, landed nearby. With national media also reporting the movement of Israeli troops towards Gaza and the authorisation of the call-up of reservists, there are growing signs of a further escalation in fighting. Israeli Defence Minister Ehud Barak said targeting Tel Aviv would "exact a price that the other side will have to pay". Early on Friday, Israel's army saidleaflets had been dropped over several locations in the Gaza Strip on Thursday, warning residents "to stay away from Hamas, and other terror organizations". "Before action, the IDF disperses warning leaflets calling all civilians to evacuate the area. This happened [on Thursday]," the army tweeted. There were reports of buses of Israeli troops - and trucks loaded with tanks and armoured personnel carriers - heading towards the coastal enclave. Israeli television stations said the build-up suggested an incursion was planned, but military officials said no decision had been made. The Hamas Prime Minister in Gaza, Ismail Haniyeh, condemned what he called Israel's "ferocious assault" against the territory. “We are going to continue hitting Hamas hard and we will continue to strike hard at the missiles targeted at Central and South Israel," Netanyahu wrote Friday on Twitter. TEL AVIV — With rockets landing on the outskirts of Tel Aviv and Jerusalem on Friday and the Egyptian prime minister making a solidarity visit to Gaza, the accelerating conflict between Israel and Hamas — reminiscent in many ways of so many previous battles — has the makings of a new kind of Israeli-Palestinian face-off. An Israeli soldier kissed his girlfriend in Tel Aviv on Friday as other soldiers waited on a bus. The military has been allowed to call up 75,000 reservists if needed. The combination of longer-range and far deadlier rockets in the hands of more radicalized Palestinians, the arrival in Gaza and Sinai from North Africa of other militants pressuring Hamas to fight more, and the growing tide of anti-Israel fury in a region where authoritarian rulers have been replaced by Islamists means that Israel is engaging in this conflict with a different set of challenges. The Middle East of 2012 is not what it was in late 2008, the last time Israel mounted a military invasion to reduce the rocket threat from Gaza. Many analysts and diplomats outside Israel say the country today needs a different approach to Hamas and the Palestinians based more on acknowledging historic grievances and shifting alliances. But the government in Israel and the vast majority of its people have drawn a very different conclusion. Their dangerous neighborhood is growing still more dangerous, they agree. That means not concessions, but being tougher in pursuit of deterrence, and abandoning illusions that a Jewish state will ever be broadly accepted here. What is striking in listening to the Israelis discuss their predicament is how similar the debate sounds to so many previous ones, despite the changed geopolitical circumstances. In most minds here, the changes do not demand a new strategy, simply a redoubled old one. The operative metaphor is often described as “cutting the grass,” meaning a task that must be performed regularly and has no end. There is no solution to security challenges, officials here say, only delays and deterrence. That is why the idea of one day attacking Iranian nuclear facilities, even though such an attack would set the nuclear program back only two years, is widely discussed as a reasonable option. That is why frequent raids in the West Bank and surveillance flights over Lebanon never stop. And that is why this week’s operation in Gaza is widely viewed as having been inevitable, another painful but necessary maintenance operation that, officials here say, will doubtless not be the last. There are also those who believe that the regional upheavals are improving Israel’s ability to carry out deterrence. One retired general who remains close to the military and who spoke on the condition of anonymity said that with Syria torn apart by civil war, Hezbollah in Lebanon discredited because of its support for the Syrian government, and Egypt so weakened economically, Israel should not worry about anything but protecting its civilians. “Should we let our civilians be bombed because the Arab world is in trouble?” he asked. So much was happening elsewhere in the region — the Egyptian and Libyan revolutions, the Syrian civil war, dramatic changes in Yemen and elections in Tunisia — that a few rockets a day that sent tens of thousands of Israeli civilians into bomb shelters drew little attention. 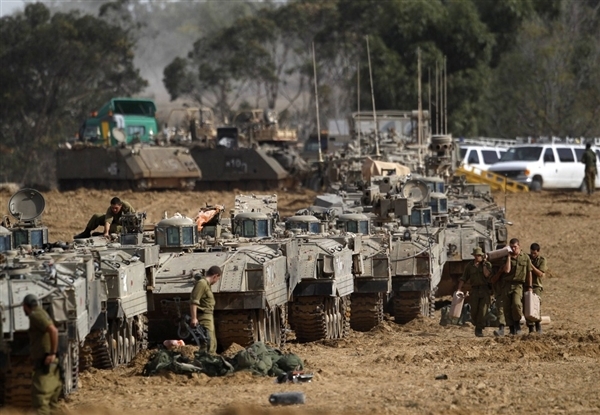 But in the Israeli view, the necessity of a Gaza operation has been growing steadily throughout the Arab Spring turmoil. 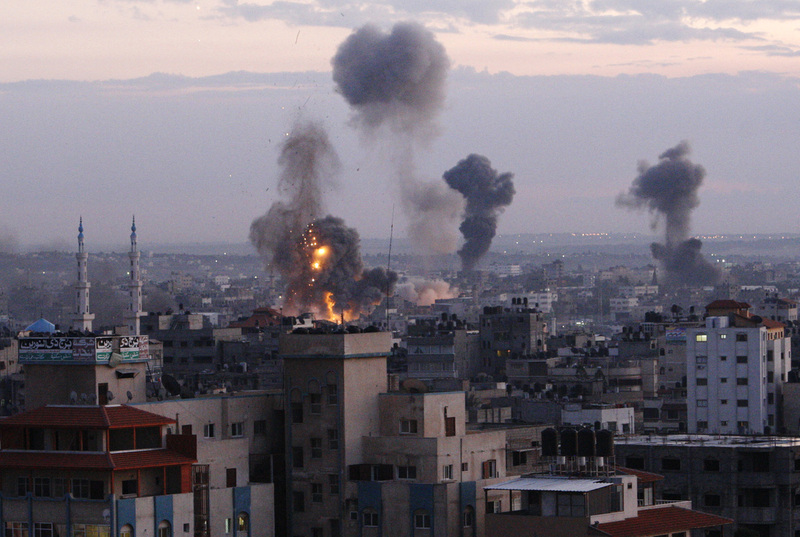 In 2009, after the Israeli invasion pushed Hamas back and killed about 1,400 people in Gaza, 200 rockets hit Israel. The same was true in 2010. But last year the number rose to 600, and before this week the number this year was 700, according to the Israeli military. The problem went beyond rockets to mines planted near the border aimed at Israeli military jeeps and the digging of explosive-filled tunnels. Gazans see events in a very different light. The problem, they say, comes from Israel: Israeli drones fill the Gazan skies, Israeli gunboats strafe their waters, Palestinian militants are shot at from the air, and the Gaza border areas are declared off limits by Israel with the risk of death from Israeli gunfire. But there is little dissent in Israel about the Gaza policy. This week leaders of the leftist opposition praised the assassination of Ahmed al-Jabari, the Hamas military commander, on Wednesday. He is viewed here as the equivalent of Osama bin Laden. The operation could go on for many days before there is any real dissent. The question here, nonetheless, is whether the changed regional circumstances will make it harder to “cut the grass” in Gaza this time and get out. A former top official who was actively involved in the last Gaza war and who spoke on the condition of anonymity said it looked to him as if Hamas would not back down as easily this time. A version of this article appeared in print on November 17, 2012, on page A1 of the New York edition with the headline: Israel, Battlefield Altered, Takes a Tougher Approach. GAZA CITY, Gaza Strip -- Israeli aircraft struck crowded areas in the Gaza Strip and killed a senior militant with a missile strike on a media center Monday, driving up the Palestinian death toll to 100, as Israel broadened its targets in the 6-day-old offensive meant to quell Hamas rocket fire on Israel. The New York Times reports that the top leader of Hamas dared Israel on Monday to launch a ground invasion of Gaza and dismissed diplomatic efforts to broker a cease-fire in the six-day-old conflict. Hamas leader, Khaled Meshal told a news conference: "If you wanted to launch it, you would have done it." He suggested that the Israeli infantry mobilization on the border with Gaza was a bluff. 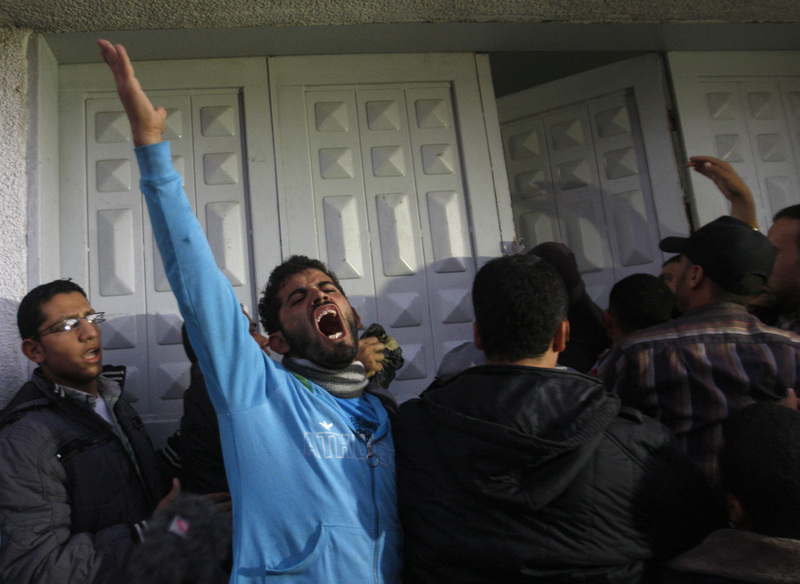 The rising toll came as Egyptian-led efforts to mediate a cease-fire between Israel and Hamas got into gear. While Israel and Hamas were far apart in their demands, both sides said they were open to a diplomatic solution - and prepared for further escalation if that failed. 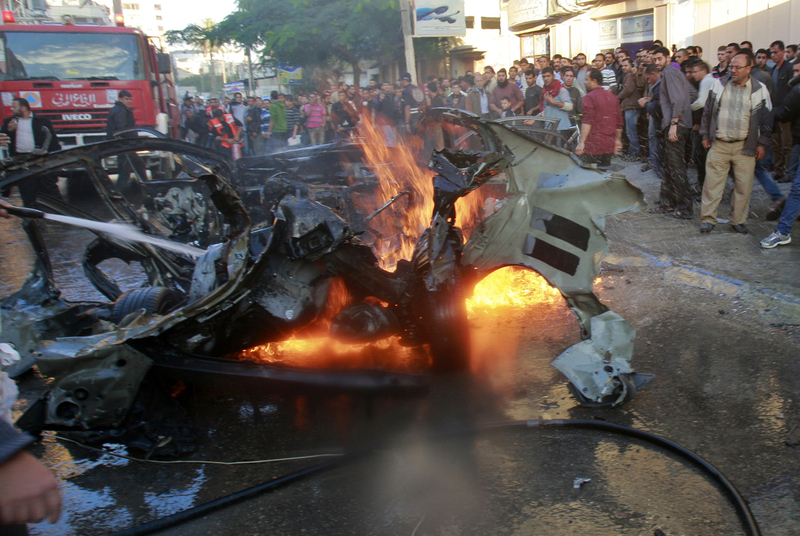 The leader of Hamas took a tough stance, rejecting Israel's demands that the militant group stop its rocket fire. Instead, Khaled Mashaal said, Israel must meet Hamas' demands for a lifting of the blockade of Gaza. "We don't accept Israeli conditions because it is the aggressor," he told reporters in Egypt. "We want a cease-fire along with meeting our demands." An Israeli official said Israel hoped to find a diplomatic solution to the crisis as well and signaled Egypt was likely to play a key role in enforcing any truce. `'We prefer the diplomatic solution if it's possible. If we see it's not going to bear fruit, we can escalate," he said, speaking on condition of anonymity because of the sensitive diplomatic efforts under way. The official said Israel doesn't want a "quick fix" that will result in renewed fighting months down the road. Instead, Israel wants "international guarantees" that Hamas will not rearm or use Egypt's neighboring Sinai peninsula for militant activity. Overall, the offensive that began Wednesday killed 100 Palestinians, including 53 civilians, and wounded some 840 people, including 225 children, Gaza heath official Ashraf al-Kidra said. On the Israeli side, three civilians have died from Palestinian rocket fire and dozens have been wounded. 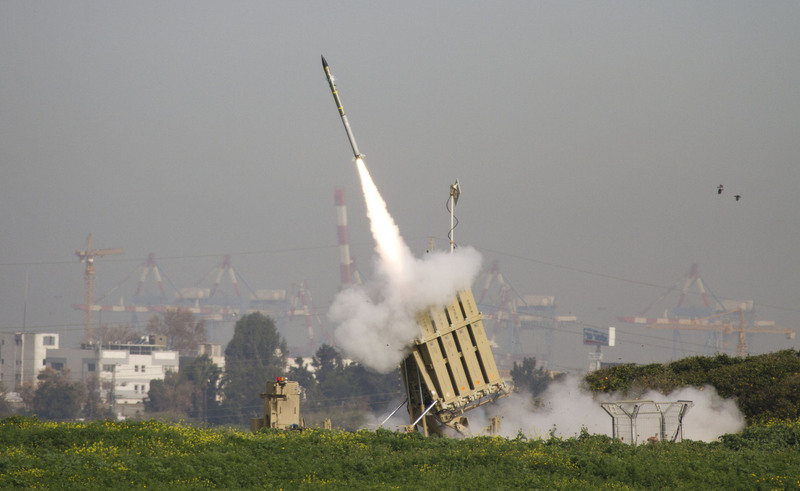 A rocket-defense system has intercepted hundreds of rockets bound for populated areas. Hamas fighters have fired more than 1,000 rockets into Israel in the current round of fighting, including 95 on Monday, among them one that hit an empty school in the coastal city of Ashkelon. Israeli police spokesman Micky Rosenfeld said 29 rockets were intercepted by the Iron Dome anti-missile battery. Rockets landed in open areas of Beersheva, Ashdod, Ashkelon, and caused damage in a number of areas. Schools in southern Israel have been closed since the start of the offensive on Wednesday, and large police units deployed in the area to respond to any potential damage and injuries from rockets. A poll published in the Haaretz daily on Monday showed widespread support in Israel for the offensive. It said that 84 percent of the public supports the operation, with 12 percent opposed. At the same time, it said just 30 percent of the public supports a ground invasion of Gaza. The poll, conducted by the Dialog agency, surveyed 520 people and had a margin of error of 4.4 percentage points. In Monday's violence, an Israeli airstrike on a high-rise building in Gaza City killed Ramez Harb, a senior figure in Islamic Jihad's military wing, the Al Quds Brigades, the group said in a text message to reporters. A number of foreign and local news organizations have offices in the building, which was also struck on Sunday. A passer-by was also killed, medics said. Thick black smoke rose from the building. Paramedics said several people were wounded. Islamic Jihad, a smaller sister group to Hamas, said it believed Harb was the target of the strike. Israel has killed dozens of wanted militants in surgical strikes throughout the operation, the result, officials say, of intelligence gathered from its collection of high-flying drones overhead and a network of informants. Before dawn Monday, a missile struck a three-story home in the Gaza City's Zeitoun area, flattening the building and badly damaging several nearby homes. Shell-shocked residents searching for belongings climbed over debris of twisted metal and cement blocks in the street. The strike killed three adults and a 2-year-old boy, and wounded 42 people, al-Kidra said. Residents said Israel first sent a warning strike around 2 a.m., prompting many to flee their homes. A few minutes later, heavy bombardment followed. Ahed Kitati, 38, had rushed out after the warning missile to try to hustle people to safety. But he was fatally struck by a falling cinderblock, leaving behind a pregnant wife, five young daughters and a son, the residents said. Sitting in mourning with her mother and siblings hours after her father's death, 11-year-old Aya Kitati clutched a black jacket, saying she was freezing, though the weather was mild. "We were sleeping, and then we heard the sound of the bombs," she said, then broke down sobbing. Ahed's brother, Jawad Kitati, said he plucked the lifeless body of a 2-year-old relative from the street and carried him to an ambulance. Blood stains smeared his jacket sleeve. Another clan member, Haitham Abu Zour, 24, woke up to the sound of the warning strike and hid in a stairwell. He emerged to find his wife dead and his two infant children buried under the debris, but safe. In another area of Gaza City, the patriarch of the Daloo family, Jamal, sat in mourning for 11 members of his family killed in a missile strike on his home Sunday. Among the dead were his wife, his son, daughter-in-law, his sister and four grandchildren. He embraced relatives and neighbors paying their condolences, his face swollen from crying. He disputed Israel's initial claim that a senior Islamic Jihad operative was hiding in his house. The mourners sat in plastic chairs just meters away from bulldozers clearing the ruins of Daloo's home. His 16-year-old daughter Yara was still missing and believed under the rubble, family members said. "I hope that by the end of the day we will receive a final signal of what can be achieved," said the official, who is familiar with the indirect negotiations. He said Israel and Hamas are both looking for guarantees to ensure a long-term stop to hostilities. The official says Egypt's aim is to stop the fighting and "find a direct way to lift the siege of Gaza." U.N. Security General Ban Ki-moon also arrived in Cairo to appeal for an end to violence. `'Gaza's demand is not a halt to war. Its demand is for its legitimate rights," including a stop to Israeli attacks, assassinations and a lifting of the blockade, Mashaal said. Israel has been jittery that a second front along its northern border could be opened, either by militants in Lebanon or from spillover from the Syrian civil war. Lebanese military experts dismantled two Katyusha rockets Monday that were equipped with timers and ready to fire at Israel, a senior Lebanese security official said, speaking on condition of anonymity in line with military regulations. Associated Press writers Hamza Hendawi and Maggie Michael in Cairo and Zeina Karam in Beirut contributed to this report. BEIRUT -- Lebanon's Hezbollah group would fire thousands of rockets into Israel in any future war and target cities in the country's heartland, the group's leader said Sunday. Sheik Hassan Nasrallah's warning came days after an eight-day Israeli offensive against Gaza ended with a truce. Nasrallah said Gaza militants had won "a clear victory" against Israel with their rocket bombardment. Hezbollah, like Hamas and other Gaza militant factions, maintains a rocket arsenal and regularly threatens to use it. It fought an inconclusive 34-day war with the Jewish state in 2006 that left 1,200 Lebanese and 160 Israelis dead. The Gaza war marked the first use by Palestinian factions of a longer ranged Iranian-made rocket, the Fajr-5. It caused no casualties but did trigger air raid warnings in the heartland cities of Tel Aviv and Jerusalem, which, unlike cities closer to the Lebanese and Gaza borders, have not experienced any sustained missile attack since Iraqi Scuds were fired in the 1991 Gulf War. Hezbollah fired at least one long-range rocket ineffectually in the 2006 war. But Israeli intelligence now believes the militant group has the capability to strike anywhere in the country, although Israel now deploys air defense systems designed to counter the threat. In the Gaza conflict, Israeli aircraft launched some 1,500 strikes on targets linked to the Palestinian territory's Hamas rulers and other groups, while Gaza militants fired roughly the same number of rockets into Israel. Nasrallah said in a speech in Beirut that the Fajr-5 attacks "shook Israel." He asked: "How is it (Israel) going to stand thousands of rockets that will fall on Tel Aviv and other areas if it launches an aggression against Lebanon?" Nasrallah spoke via a video link from a secret location to tens of thousands of supporters in Beirut who gathered to mark Ashoura, the annual Shiite commemoration of the 7th-century death of Imam Hussein, the Prophet Muhammad's grandson. Hezbollah fired nearly 4,000 rockets at Israel during the 2006 war and is believed to have upgraded its arsenal since then. Nasrallah did not say how many missiles and rockets his group possesses, although in the past he said they have more than 20,000. Israel estimates the number at several times that. "The battle with us is going to be all over occupied Palestine," the black-turbaned Nasrallah said. "From the border with Lebanon to the frontier with Jordan to the Red Sea." "The Israelis should listen well to me. From Kiryat Shemona to Eilat," Nasrallah said referring to a northern Israeli town near the border with Lebanon to the southern resort town of Eilat on the Red Sea. Since the 2006 war ended, both Israeli and Hezbollah officials have been warning each other that the next battle between the two groups will be more destructive. Some Israeli generals had spoken of the "Dahiya doctrine," named after the Beirut suburbs considered a Hezbollah stronghold where Israel turned dozens of buildings to piles of debris in 2006. In August, Nasrallah said Hezbollah will transform the lives of Israelis to "hell" if Israel attacks Lebanon, adding that the group would not hesitate to hit targets that would leave tens of thousands of Israelis dead.